The idea that there is nothing new under the sun is an old one. But even the sun changes. We have been reminded of that recently by periods of intense solar storm, sun spots and a contrasting period when there seemed to be no solar flareups whatsoever. So even the sun becomes new every day as it gradually grows older, and what's under it cannot and will not stand still whether we would wish it or not. The idea of the old making itself new is brought home musically in pianist Lara Downes' recording 13 Ways of Looking at the Goldberg: Bach Reimagined (Tritone Records). The idea was to take Bach's Aria from the Goldberg Variations and commission 13 composers to write a short piano work that transforms, comments and reacts in some way to the original. These 13 variations on variations, so to speak, were then performed by Ms. Downes alongside the Aria, giving us a new extension, a reimagination of Bach. The Irving S. Gilmore International Keyboard Festival commissioned the works in 2004 and Lara Downes gives us here the world premiere recording of them. It's a rather brilliant idea. Happily nothing is lost between the original idea, its fruition in the works and this performance. The composers are a goodly assortment of individuals working in the full spectrum of styles available on the contemporary scene, as well-tempered by the influence of Bach and his Aria. Some composers are known for reimagining baroque pieces and other pre-modern works. So we have the very logical choices of Lukas Foss and William Bolcom, for example. Then we also have the very familiar names of Jennifer Higdon, Fred Hersch (from the improvisatory jazz camp), and David Del Tredeci. Still further we have composers whose names are not overly familiar to me. The end result is a most convincing flight of 13 musical imaginations over the familiar terrain. Some stay closer to the thematic and/or harmonic aspects of the Aria than others. There is represented a rather dramatically contrasting myriad of styles that make up modernity today. Their hobnobbing in close quarters with Bach's Aria as the conversational topic makes for exhilarating listening. The sequence begins and ends with a statement of Bach's theme variation to better set off the various paths away from his musical treatment, and back again, so to say. To round off the program Ms. Downes plays two modern pieces that relate to Bach as well, Dave Brubeck's Chorale from his Chromatic Fantasy Suite and Lukus Foss's Prelude in D. Finally Lara concludes the program with Bach's Saraband from the French Suite V.
Ms. Downes handles the disparate variational buffet with poetic grace and respectful hommage-ination. It's a fine performance of a very attractive program. There is much to re-hear, to digest, and I suspect I will be doing that for many years to come! Very much recommended. 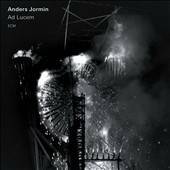 Anders Jormin, composer and contrabassist, has put together a most distinctive album, Ad Lucem (ECM 2232 2786145). Though it's not what I might usually review on this site, a bit of cross-fertilization is healthy, and it certainly is not out of place, either. 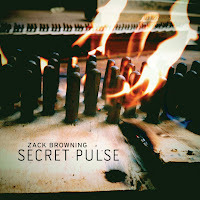 The music is a kind of hybrid combining new jazz, ambient music and new music. It features the instrumental trio of Jormin on contrabass, Fredrik Ljungkvist on clarinets and tenor saxophone, and Jon Falt on drums/percussion. Then it adds two vocalists in Mariam Wallentin and Erika Angell. There are pieces that utilize the vocalists in close, archaic harmonies that remind of early music as filtered through new music composers like Arvo Part, other times they sound more in the ECM style of jazz, still other times there is a folkish quality. The trio has a solid improvisational sense; each is a good improviser with a clear role to play in any given piece. Very compelling and unusual are the combinations of the tight harmonies and ambient quality of the singers, the rich-toned intelligence of Jormin's contrabass, Ljungkvist's tone and improvisational facility and the well played, well defined role of Falt's drums and percussion. All takes place within a compositional framework that increases or diminishes in proportion to the amount of improvisation present in any given piece. This is music that creates a distinct mood in distinct ways. It is quite listenable yet there is depth and presence throughout. Something different to listen to and, one hopes, like. I think you may well find this one very interesting, whether or not you ordinarily listen to jazz per se. William Thomas McKinley's, Concert Variations, which place both violin and viola in the solo spotlight. These are three melifluous yet modern concerti, well played with good sonic presence by the Moravian Philharmonic or the Warsaw National Philharmonic, and soloists doing a fine job as well. The McKinley concerto is the more somber of the three overall, and to me the most moving, with a Lamento forming the theme for a series of variations and the composer creating a vivid footprint that evinces a thematically inventive imagination and orchestrational brightness. The Michal work pays tribute to three contrapuntal masters, Hindemith, Bach and Prokofiev, and sounds a bit closer in general to Hindemith than otherwise. Sackman's Concertino has a vibrant fanfarish opening and a rhymically lively final movement with a bit more reflectivity in the middle section. The violin solo part is technically and compositionally weighty and Ondrej Lebr impresses as the protagonist violinist. In sum, all worthwhile works, done to a turn. 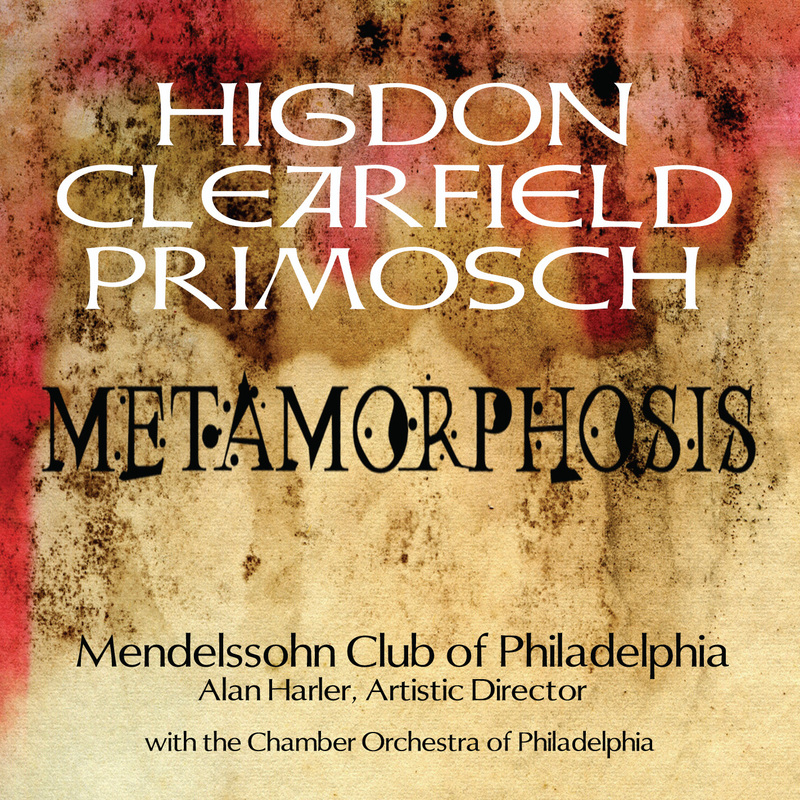 The Mendelssohn Club of Philadelphia, a venerable choral organization, has been concertizing for 138 years. Only in the current tenure of artistic director Alan Harler however have they turned to commissioning new works. My press information informs me that there have been nearly 50 such commissions over the last two decades. 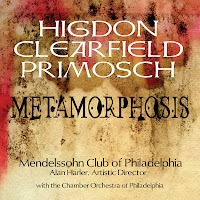 Harler and the chorus have teamed with the Chamber Orchestra of Philadelphia to record three recent commissions and the results are now available as Metamorphosis (Innova 806). They chose three contrasting works by some of the leading lights among Philadelphia composers. Jennifer Higdon's music has gained the most currency of the three, having been the subject of a number of acclaimed recordings and even more performances on the concert scene of late. Her "On the Death of the Righteous" is based on a John Donne sermon. The choral-orchestral writing nicely underscores the mystical-judicial-ecstatic aspects of the sermon's concern with the equality of all righteous beings at the last judgement. There is a rather striking contrast between a somewhat tumultuous orchestral brilliance and the gentle persistence of the block sonorities of the chorus. Andrea Clearfield's "The Golem Psalms" is almost an oratorio, relating the story of the ill-fated humonculous of Hebrew folklore, his creation, fall and destruction. There is a good bit of choral recitation in an orchestral setting, spiced by the effective narrative part handled well by Sanford Sylvan, baritone. It is a work that largely succeeds in creating dramatic tension and a sense of mystery and foreboding. James Primosch's "Fire Memory/River Memory" has a more choral/symphonic through-composed quality. The music has a harmonically more adventurous palette and well crafted choral-symphonic sonances. Of the three works, this one has the most sweeping flow to it. It revels in suspension and release, choral part writing that is set off very effectively by poetic orchestration, a solo violin part that weaves in and out of the neo-impressionist orchestral light and shadow. The final of the two movements has some fireworks of an orchestral sort and more of the beautiful choral writing that permeates the work as a whole. 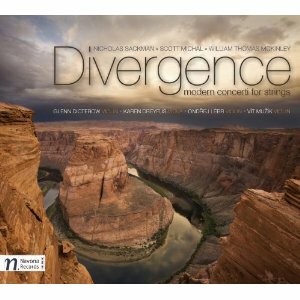 This recording may not set the world on fire, but in the end it is a satisfying look at a marvelous choral organization and three interesting contemporary works. It may not be an essential addition to your library of contemporary music, but for those who favor works of a neo-romantic and beyond quality in the choral-orchestral genre it will be of genuine interest. If like me, you have somehow managed largely to miss the music of Eleanor Hovda (1940-2009) you are in for a nice surprise. Innova has amassed a four-CD collection of her music, The Eleanor Hovda Collection (Innova 808), and it is a revelation. Ms. Hovda has a sense of musical space that at times is a bit East Asian. Like some Chinese, Japanese and Korean traditional classical music, the sound and its wrapping in musically reverberant silence can be integral to the effect. Her attention to the dramatics of sound production also has some Asian qualities. For her, the impact of the music need not reside in the dual contrast quiet/loud, though that can be part of her dynamic. Intensity of sound color versus a more "grey" quiescence, musically italicized articulation version a more everyday "Roman" ordinariness of sound, a more vertical than a horizontal orientation to the sound events, in the sense that there are a series of inter-related occurrences more than a linear narrative, these are a few of the things that set her apart. Whether it's a matter of a single conventional instrument, an ensemble, an electroacoustic or electronically generated sound source, or a combination of any of these elements, her singular attention to sound sculpturing and the nature of that attention mark her as very much in her own musical world. It's as if you take some of the sheer sensual sound extensions of Crumb's and Cage's piano works and make that a basis, a starting point to go somewhere very much your own. She seems to do that. She also does not in her music draw brackets around "electroacoustic" and "conventional" sound production. She approaches both from a kind of uniformly personal stylistic perspective. All become Hovda. The four CDs of the set include so much music of interest that I don't think I can easily highlight the high points without over-encumbering this review with too many details. Suffice to say that there is some startlingly singular music generated throughout. It is one vast soundscape in some ways, each piece a part of a larger whole which encompasses all. And that whole reveals a composer we need to hear with concentration. 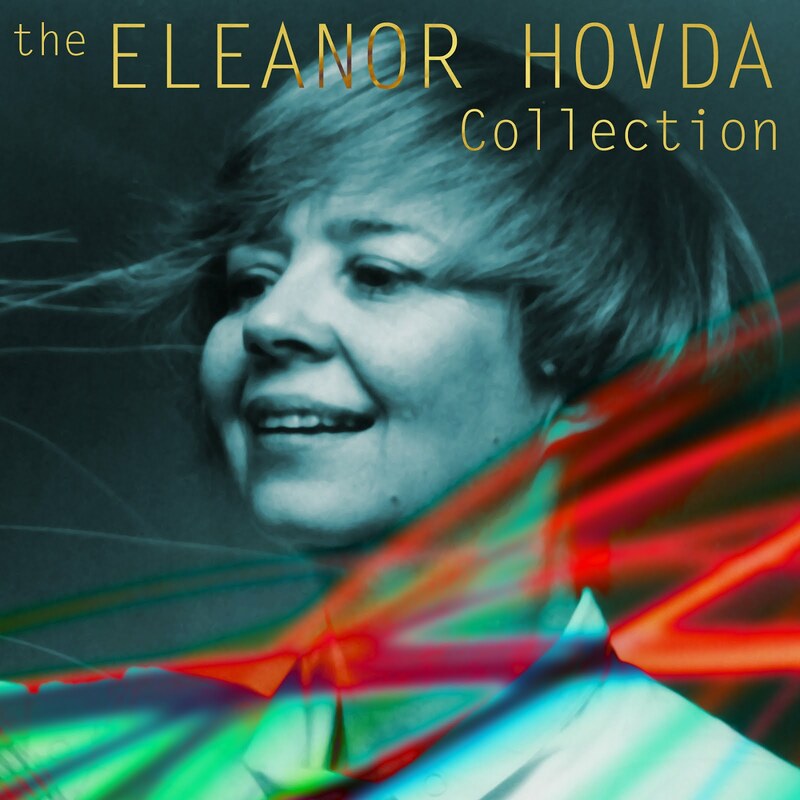 I believe that The Eleanor Hovda Collection is destined to join the ranks of the most important releases of this decade in the "New Music"/"Avant Classical" categories. It contains some remarkable music. It should go a long way in establishing Ms. Hovda as one of the more important sound artists/composers of our era. 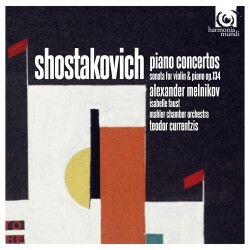 For whatever reason, it took me a while to appreciate the music of Shostakovich in my early listening days. He seemed overshadowed by Stravinsky, Prokofiev and a dozen or so innovative modernist composers that were and still are in currency. 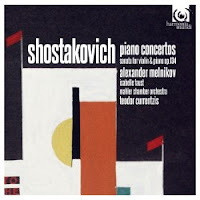 Shostakovich struck me as being a somewhat lesser figure. Eventually I came to know and love the symphonies, and that took a lot of time because there were so many and they embraced such stylistic diversity and evolutionary development. Then came the string quartets and finally the solo piano music. I now appreciate him, though I feel it's still better not to compare but to approach him on his own terms. I will confess that I've listened to most if not all his concerti repeatedly, but find less there to like. It may just be that I am not focusing enough. I don't dislike the music, but it doesn't linger in my memory either. Perhaps until now. Pianist Alexander Melnikov takes on in a new recording the Piano Concerto No. 2 Op. 102 in F Major, the Concerto for Piano, Trumpet and String orchestra Op. 35 in C Minor, and as a bonus, the Sonata for Violin and Piano Op. 134 in F Major (Harmonia Mundi). He is accompanied by the Mahler Chamber Orchestra under the direction of Teodor Currentzis. The Piano Concerto No. 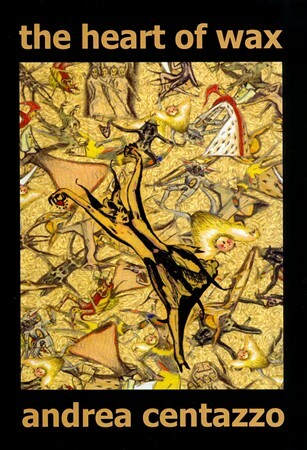 2 is given a specially sensitive reading, with the slow movement sunk in revery, the outer movements bristling with animated grace. Melnikov quite obviously is the right pianist for the job, and he can startle one with his brilliance. I am glad to have his version of the Opus 35, which seems close to being definitive. This aspect of Shostakovich's ouevre continues to perculate inside me. I have not entirely converted to its point of view. Melnikov and Company however come as close as I think anybody in convincing me. Andrea Centazzo the composer continues to unfold before my ears as I listen to his minimalist opus The Heart of Wax (Ictus 301), a 12-part dance suite for a large chamber ensemble, string quartet and soloists. This is an infectiously rhythmic and melodically memorable set of contrapuntal movements, inflected at times by rock, jazz and world elements, following out of similar mallet-wind-string ensemble works by Reich, yet bearing palpably the recognizable imprint of Andrea Centazzo's own originality. For minimalism to work, there must be inventive scoring. Nothing can be more dreary to my mind than a minimalism of uninspired and uninteresting motifs and/or one-dimensional instrumentation. Thankfully that is not the case with Centazzo's work in the style in general and in Heart of Wax especially. There is much to occupy the actively listening ear on this one. It's a refreshing hybrid that operates on a high plane throughout. Give it a listen. Composer Wolfgang Rihm celebrates his 60th birthday this month. 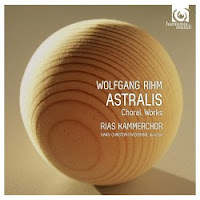 Fittingly a major release devoted to his music, Astralis and Other Choral Works (Harmonia Mundi 902129), has just been released. It shows you in moving fashion the composer's post-high modernist stance, and the influence of early music, a penchant he shares with contemporary composers Part and Gubaidulina, among others. That does not mean that a close listener would mistake his vocal music for the others in a blindfold test. It has its own trajectory, perhaps more linear in its unfolding. The Astralis release covers three of his mostly acappella choral works: Fragmenta passionis, written when the composer was only 16, Sieben passion-texte, and the 2001 Astralis. All three are performed with care by the RIAS Kammerchor under Hans-Christoph Redemann. There is a cosmically ambient quality to this music, with less contrapuntal part writing than a slowly unfolding modern-archaic quality, a harmonic sounding of a shifting simultaneity. It's quite beautiful, quite aetherial and a affective experience. Astralis gives you a side of Rihm you will want to appreciate. The sound is excellent and the music on the side of the angels. 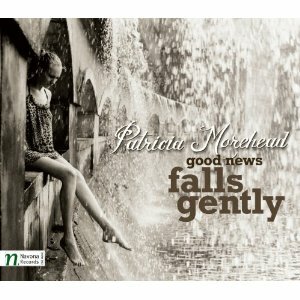 Patricia Morehead composes music that is tonal and lyrical with a touch of Americana meets early-mid Schoenberg. That's perhaps too much of a simplification, and she goes about it all in her own way, but it is the impression I get listening to Good News Falls Gently (Navona 5854), a recent CD devoted to her chamber/chamber orchestral works. There are five of them represented on the disk. All have a particular world to occupy and they do it in memorably pleasing ways. "Disquieted Souls" for mid-sized chamber ensemble has a fair amount of the lyric Americana side of her work mixed in with some modern melodic architecture. It alternates interestingly a kind of post-Shaker semi-simplicity with a tone-row sort of semi-complexity (though she does not appear to be writing in rigorous 12-tone fashion at any point). Carolyn Hove does the honors on the beautifully wrought solo English Horn part and sounds very good indeed. "The Handmaid's Tale" for two pianos is unabashedly modern sounding, combining chromatic expanded tonality/12 tonality with transformed melodic material that sometimes alludes to early blues/stride, other times something more contrapuntal-fugal. "It is Dangerous to Read Newspapers" for soprano and piano is marred by the soprano's rather exaggerated operatic declamation, very dramatic and filled with a rather wide vibrato that does not seem in keeping with the work. "Ladders of Anxiety" for mixed chamber group and solo flute (played well by Caroline Pittman) brings back the well-conceived mix of lyricism and more-or-less pre-serial modernism. It engages in some interesting contrapuntal interplay, with each separate line having inventive interest yet all blending together well as a cohesive statement. The final, title track is for full chamber orchestra and soprano (Jonita Lattimore). This time the soprano's style of presentation suits the musical context more appropriately. The work nicely exemplifies with lyrical-modern grace the Americana meets early modernism of Ms. Morehead's style. This is a disk that gives one a good look at a rather little-known composer. I must say that the effect is very good overall and that it made me want to hear more of her work. She writes music that makes full use of wind-string sonarities with a sound as colorful as it is melodically vivid. Bravo. I find that the first version of a classical work that I have heard (assuming that I own it and listen to it successively over the years) is the one that I almost involuntarily use as my benchmark when hearing new versions. That has been true of Ralph Vaughan Williams's A London Symphony (Symphony No. 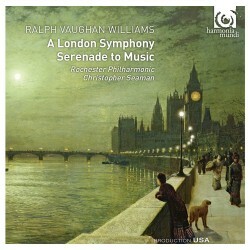 2) which Christopher Seaman and the Rochester Philharmonic have recorded and now released this month in a program that includes Vaughan Williams' "Serenade to Music" (Harmonia Mundi). It doesn't matter who did the version I still have on LP, because I am sure it is long out of print (it isn't Boult). What matters is that I heard that version in my head as I first listened to Seaman's/Rochester's new recording. The symphony was first performed in 1914, then was lost and had to be rewritten from memory by the composer, who in the process revised it somewhat. By 1920 the present version was well in hand. I say all of that only because there is a marked contrast between the London and Ralph's First "Sea" Symphony, which was in part more in the romantic, epic mode whereas the London work has budding folk, vernacular and English impressionist elements. The symphony has programmatic aspects as well, each movement more or less depicting a particular scene at a particular time, or alternately, the passing of the old order in the last movement. It is a work of quite accessible charm, lyrical homespun unpretentiousness, one of many such Vaughan Williams compositions. The LP version I have long heard has perhaps more of the grandeur latent in the score. Seaman and the Rochester Philharmonic temper that grandeur more with the homespun Vaughan Williams, so perhaps it is a more balanced reading. It is impressive in its overall treatment, but especially so in the lento and scherzo movements. The performance celebrates and marks the end of Seaman's 13 years as Music Director of the Philharmonic; quite appropriately so, one might add. The disk also contains a rather lovely reading of "Serenade to Music," soloists, choir and orchestra sounding suitably plaintive and stirring in turn. If you don't have the symphony already this version is a good bet. If you do the treatment of the lento sections will no doubt be welcome. Recommended. Leonardo Balada (b. 1933) has a sweeping grasp on the music of his native Catalan and often combines it with his own take on classical modernity to forge a strong musical identity. 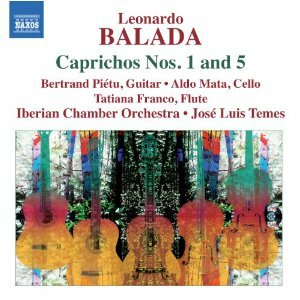 You can hear that clearly and most pleasurably on the new release by the Iberian Chamber Orchestra under Jose Luis Temes (Naxos 8.572625). Caprichos 1 and 5 form the centerpieces of the program. "Caprichos No. 1" (2003) is a homage to the poet Frederico Garcia Lorca and features Bertrand Pietu on classical Spanish guitar. It has vibrancy, much in the way of folk-dance allusion, a lively solo guitar part and the spicy tang of modern harmonic transformations. "Caprichos No. 5" (2008) honors composer Isaac Albeniz, puts Aldo Mata's cello work into prominence and features well-wrought transformations/resituations of Albeniz's music. The string orchestra parts again have the tang of the present along with a "through the looking glass" treatment of Albeniz themes. Both works show Balada as the master of string orchestral writing, with brightness and depth coming out of a solo-orchestral dialog more concerned with musical affect and expressive lyric/dynamic modernism than with displays of technical acrobatics, though the players show a beautiful sense of form and dramatics in the performance of their parts. 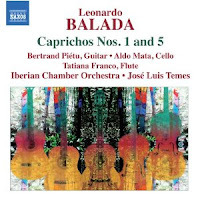 These are extraordinarily appealing works that show Balada to be in full command of his own voice, characteristically adept at making the old and new his own. As an added bonus there are two additional works, "A Little Night Music in Harlem" (2006) and "Reflejos" (1988), the latter featuring a solo flute part played with zest and enthusiasm by Tatiana Franco. These pieces continue the modern-meets-local-tradition thematics of the Caprichos. This is music of immense charm, played with joyful concentration and forceful dynamism by the Iberian Chamber Orchestra and the soloists under the masterful conductorship of Jose Luis Temes. This is a side of Balada that many will find nigh irresistable, I would think. I've come to the music of Rautavaara (b. 1928) only in the last few years. He has a few stylistic periods but there is an overall musical personality that prevails, though I have yet to grasp it fully. I have had the chance to listen with some care to a new release in the last few days that covers with finesse and interpretive sensitivity two later works and one earlier (though recently revised). 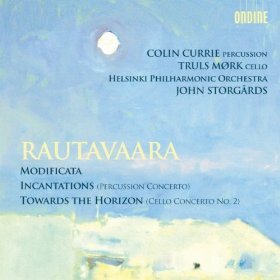 John Storgards and the Helsinki Philharmonic Orchestra take on Rautavaara's "Modificata" (1957/2003), his Percussion Concerto "Incantations" (2008) and his Cello Concerto No. 2 "Towards the Horizon" (2008-09) (Ondine 1178-2). "Modificata" has the singing lyricism and rhapsodic sprawl of his later works, only it utilizes a 12-tone row as its principal generating device. It has a northern sensibility, following in part in the footsteps of Sibelius insofar as a skillful and poetic orchestrational ability is quite evident even in the earlier period. The row expands the tonality of necessity, yet it sounds less atonal than it does key-centered and expanded in tonality. The orchestra evokes; the music fills one with a certain wonder. Rautavaara paints in tones, as is clear even then, and one emerges from the work with a feeling of having received a musical revery and reflection that goes beyond the verbal. It's a work of seriously beautiful and moving sounds. The Cello Concerto No. 2 finds us in more declamatory territory, with soaring phrases that have complex harmonic modernisms yet also have an emotive romantic quality. The cello part, well played by Truls Mork, functions in part as the lead melodic vehicle around which the orchestra responds and converses in lyrically mysterioso ways. 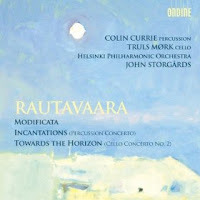 Rautavaara the rhapsodist is in full play in this work, yet his way with harmonic density makes the music sound modern. His other late work on the program, "Incantations," brings a harder edge to the rhapsodism with the wooden tone of marimba and the sharper edged virtuoso drum melodics putting the music into energy-motor territory. The percussion part is no doubt difficult to play well and Colin Currie as the soloist does a great job phrasing the dynamic, ever-transforming part in ultra-musical terms. Despite the more overtly extroverted nature of the work there still pervades a kind of wondrousness to the music that should appeal to many. There is a largoesque middle movement that brings in a more ruminative state, then the finale highlights agitated marimba work and restless strings, impressive drum and cymbal fanfares and fluttering winds. A rather restrained middle section has glowing vibraphone motor candenza passages. Then the full orchestra emerges for a rousing sort of lyrical hardness, recapitulating the thematic material from the first movement. Rautavaara, early or late, writes orchestral music of a very personal stamp. The three works presented here give us a fascinating glimpse into his development as a musical voice at the beginning and in the later stages of his compositional career. These are impressive and pleasing works. Storgards, the Helsinki Philharmonic and the soloists do the music justice with sonorously impressive readings and enthusiastic verve. Recommended for both samplers and completists. 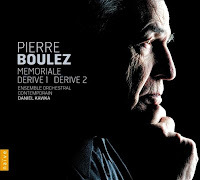 Of all the composers that came into prominence in the second half of the twentieth century, Pierre Boulez remains as central as ever to the original style he helped initiate and develop. He has, perhaps with similarities to Elliot Carter on this side of the pond, sought to realize more and more fully the complex musical language he helped forge, in the process remaining one of its singularly most fluent and eloquent voices. He has not changed his style to suit the passing fancies of later years, but instead has worked and reworked the interlocking complexities he favors to a level that may never be surpassed for sublimity and profound refinement. A new disk of some of this later works demonstrates this with admirable spirit and clarity. Daniel Kawka and the Ensemble Orchestral Contemporain offer some essential readings of Boulez's "Memoriale" (1985), his "Derive 1" (1984) and "Derive 2" (1988, rev. 2001, 2008). The former works are short, succinct, in some ways preparations for the now 55 minute "Derive 2." And for all the charm and brilliance of the two earlier works, "Derive 2" in Kawka's hands transcends the merely modern to become a thing-in-itself--a dense contrapuntal rush of motion and transformation. 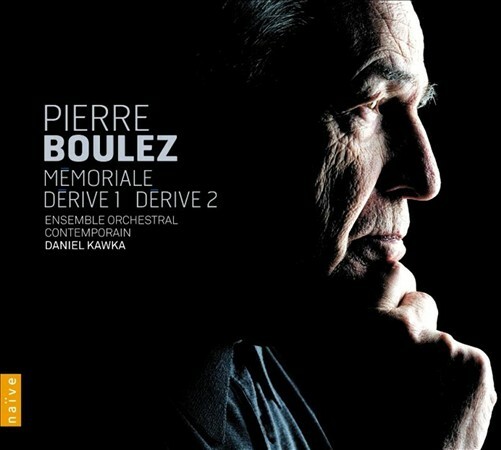 Boulez himself made a rather wonderful recording of the two Derives some time ago, but he has not to my knowledge recorded the revised version of the #2. And if anything this piece shines ever more brightly on the Naive (782183) release at hand. Like Bach's later works, Boulez's "Derive 2" reworks the prexistent (Darmstadt School) style to a point of transcendent brilliance. Mercurial phrases jostle against each other as sectional blocks of the chamber orchestra contribute aurally striking and melodically vital post-tonal parts to the jigsaw puzzle of the whole. It is certainly one of the master's finest works. Kawka and the Ensemble Orchestral Contemporain emphasize the remarkable plasticity of form and inventiveness of content in a rendition that ought to be one of the primary benchmarks for the work and Boulez's later period in general for many years to come. The French Organ School that began with Franck and ended more-or-less with Messiaen is a body of music that established the cathedral organ as an instrument of symphonic proportions and made the freely composed fantasia-like organ style a dynamic, breathing modern art form. Somewhere in the center of it all is Charles Tournemire (1870-1939), who wrote sprawling masterpieces of freely mystical, cosmic breadth. 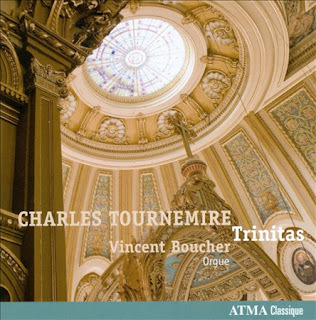 A new disk, Trinitas (Atma Classique 2472) of some of his solo organ gems just came out with Vincent Boucher offering a very pleasing program played on a marvelous instrument, with ravishing sound. Boucher gives us near definitive performances of Tournemire's "Triple Choral," three movements from "Postludes libres pour des Antiennes de Magnificat," and five from "L'Orgue mystique." Partially because of the nature of the function of the organ in the liturgical setting it has long been an instrument that cultivates great improvisers--from at least Bach's time onwards, and Tournemire's music has that freshly improvised feel. In the hands of Boucher and with the pristine dynamic range and audio depth in this excellent recording, we hear Tournemire in his many-layered complexities, almost as if for the first time. For all those devotees of the French school, or those new to it, Trinitas is a (pardon the pun) Godsend! 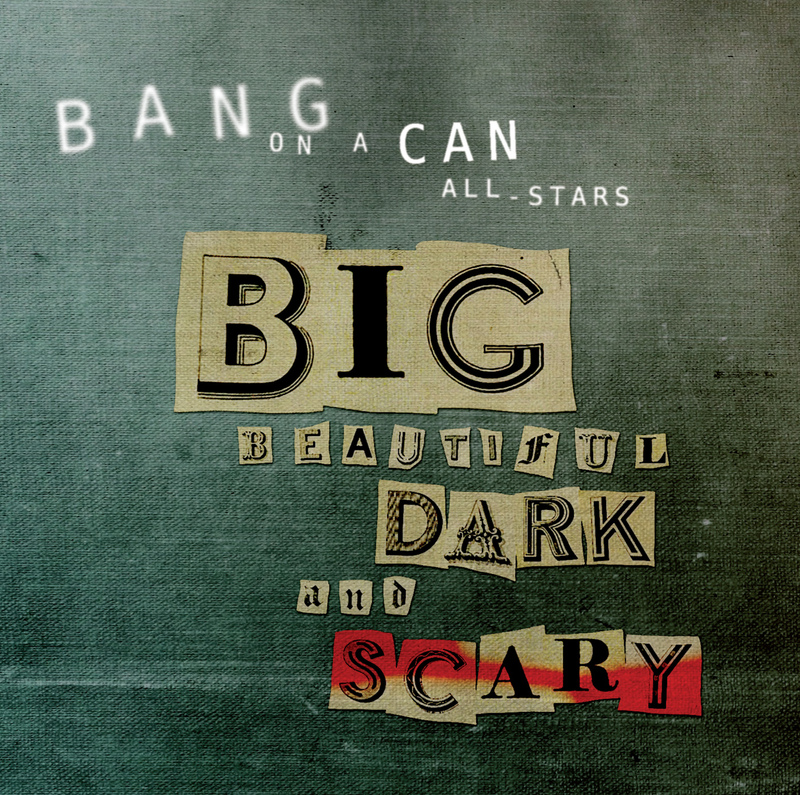 Bang On A Can All Stars, "Big Beautiful Dark and Scary"
Whatever minimalism is in music today, or whatever word you would rather use to describe the contemporary classical music of recurring periodicity, the Bang On A Can All Stars are at the vanguard of it, at least here in and around Manhattan. 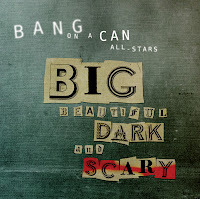 So when they come up with a special 2-CD set commemorating their continued success, namely Big Beautiful Dark and Scary (Canteloupe 21074) it is rather an occasion. There are 89 minutes of music, pieces by Wolfe, Lang, Gordon, Ziporyn, Longstreth, Nancarrow, Andriessen, Moore--the founders and others. As is the nature of the Bang On A Can folks, they take chances and seek to do new things within the forms of contemporiety, so that not every composition is going to appeal to everybody. And for me some seemed just a hair on the crude side, others were interesting, still others I found quite beautiful and moving. There are pieces that show a kind of hard rock insistency, others that go off into space in exploratory ways and yet others that have a more lyrically expressive side. So this is an occasion where in marking it BOAC shows they do not intend to drift into a complacent stance. They aim to innovate and they succeed, most of the time. So if you want to be in a conceptual space where things are moving along, morphing, generating the excitement of the new, this set is one place you want to dwell within. So do not miss out on the future. Here is part of it. There's nothing quite like a new discovery to reassure one that the intensive work of listening to new music and writing these blogs is worthwhile. 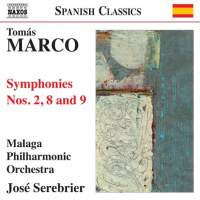 Today I cover the symphonies of contemporary Spanish composer Tomas Marco, more specifically Jose Serebrier and the Malaga Philharmonic's recording of Marco's Symphonies Nos. 2, 8 and 9 (Naxos 8.572684). Nos. 8 & 9 are world premier recordings. Marco writes dense scores that have national elements as well as multipart structures that sometimes remind one of Ives's poly-thematic complexities, only working with original and Spanish grassroots musical idioms as building blocks to a very personal symphonic vocabulary. Marco's No. 2 is perhaps the densest and most dramatic. No. 9 combines medieval motifs, the liner notes tell us, with a kind of portrait of the sea spirit "Thalassa." There is a recurring theme that recalls Stravinsky's "Rites" and it weaves its way throughout the work. No. 8 Gaia's Dance has rhythmic and melodic motives that suggest folk dance forms but are treated by Marco as raw material to his larger end of creating multistranded polysemantic orchestral significances. This is a composer going his own way. There are complex dissonances and simple folk melodies conjoined in labyrinthian matrices, all bearing the stamp of originality. With Jose Serebrier at the helm the complexities of Marco's music are articulated with expressive heft and drive. Tomas Marcos and these symphonies should be heard by anyone with an interest in the modern symphony and contemporary Spanish music. A provocative recording that is not to be missed. Edvard Grieg (1843-1907) had a lyrical streak in him that has made him a favorite with all kinds of people. If you are like me you grew up hearing and loving his "Peer Gynt Suite" and later perhaps some of his singingly immediate solo piano music (plus the Piano Concerto) and have sought to reproduce that feeling by sampling his other works. Nevertheless not everything Grieg wrote was at the same lyrical level. But there is more to Grieg than melodies you can whistle, of course. His treatment of folk-like material, his fine compositional craftsmanship, his Northern sensibility, musically speaking, his sunlight and sundowns. The String Quartets are not as well known as perhaps they should be. They are filled with a lyric light--not in some whistle-able sense, but in the sense of his treatment of themes in the somewhat more formalist context of a string quartet. There are two quartets that survive, the completed Quartet in G minor, Op. 27 and the unfinished two movement F Major Quartet (there also was one that has been lost to us). Alf Ardal has arranged both works for String Orchestra and they are available in a new recording by the Oslo Camerata (Naxos 8.572441) along with Nordheim's "Rendezvous," an attractive string orchestra work from 1986. The good news is that Ardal's arrangements successfully give us what seems like new Grieg. He has transformed the works so fully into the orchestral context that they seem like wholly new works. So what are they? Folk-laced excursions into the special lyricism for which Grieg is known and revered. The Oslo Camerata sounds quite lively and spirited, and the sound is quite decent, if a little on the reverberant side. Oh, and the Arne Nordheim (1931-2010) composition gives you another 20 minutes of interesting Northern string orchestra music, in a more modern a vein of course. 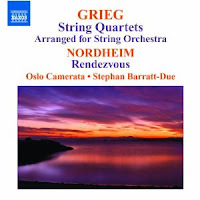 Any lover of Grieg will find this disk a wonderful experience. Those who enjoy and appreciate the Scandanavian, Norwegian musical corpus in general will go for this as well. It's good music, too. Anybody should find it appealing. Philip Blackburn composes music that hangs together with a kind of natural ambient discursiveness. 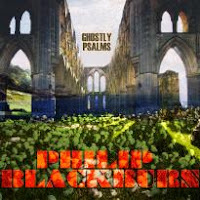 His new CD Ghostly Psalms (Innova 246) is a triumvirate of works with the long 10 part title work sandwiched between the relatively brief "Duluth Harbor Serenade" and the concluding "Gospel Jihad". The opening work collages the sounds of the harbor in Duluth, Minnesota: church bells, boats, horns, sirens, etc. with additional musical instruments. It's a soundscape that evokes as it unveils a panorama of the everyday pitched and unpitched sounds inherent in the world of the harbor. Blackburn has a keen ear for the musical nature of the environment and realizes its combinatory qualities in very appealing sonant ways. "Ghostly Psalms" uses various vocal ensembles, musical instruments and their ambient transformations onto the soundstage for a kind of narrative musical prose that increasingly foregrounds long tones and sound envelopes produced by bowed cymbals, organ, voices, recorders and their acoustic-digital enhancements along with a more exotic component of unusual instruments (from what I hear) and unconventional articulations. It gives me the uncanny feeling of hearing medieval through baroque sacred music in a kind of haunted dreamscape, where there are floating worlds of sonic residues, once a part of a musical whole but now destined to float through space, still ethereal yet disjointed, separated in their demise from their original home, wandering the aural spaceways in search a resting place. This of course is a personal interpretation. But regardless of what the music may associate to you and resonate with you personally, it is eloquent and linear in a very original way and it lays out in your listening present with dramatic impact. "Gospel Jihad" winds up the program with a short work for the Choir of Clare College, Cambridge, acting as a crowd of voices, blocking out otherwordly clusters of chordal tones, popping, whistling and clicking, mumbling, shouting and rustling in reverberant space. It is a religious Tower of Babel that seems to be depicted, something we may well be experiencing in today's world. It is movingly done. The cumulative effect is coherent, discursive, and complex in ways that allow repeated listenings to reveal the whole little-by-little, with connections becoming more apparent and complexes of sounds unveiling new and richer musical meanings the more one listens. These are some of the most compelling soundscapes I've heard in a long time. It is new music that has learned from the past 100 years of aural experimentation and creates finished works that use the vocabulary of sound color in masterfully expressive ways. Very recommended. Glenn Gould of course had his own way of playing Bach on the piano--fast, sometimes, interpretively modern, nearly always. 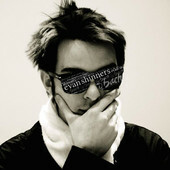 Evan Shinners, an upcoming pianist on the scene, follows in that lineage with a recent disk devoted to Johann Sebastian's music for keys entitled @Bach (New Cull). It was recorded live in performance and subsequently has a few minor clams here and there, but that is made up for with an expressive exuberance. He takes on the B-Flat Partita and the French Suite bwv 816 with zest, performs two Toccatas with improvisations added in an imaginative way, and then joins the SUITES chamber ensemble in a madly dashing version of the Concerto in d minor (bwv 1052) that, again, may not be a perfect performance, but makes up for it in spirit. Tempos are generally pretty rapid and Shinners is in an appropriate fettle. All tends toward the happily tempestuous. Mr. Shinners has promise and the program keeps your ears in motion throughout. Pianist Denes Varjon's Precipitando (ECM NEW Series B0016486-02) covers three solo piano works from the period beginning in 1852-53 (Franz Liszt's Piano Sonata in B minor), ahead to the early work by Alban Berg, Sonata, Op. 1 from 1907-8, and through to 1912 and Leos Janacek's In the Mists. 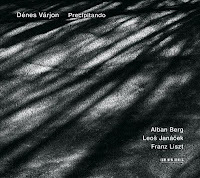 Varjon throws into relief the influence Liszt casts over these two early modernists at the outset of the 20th century--by programming the three together, and by bringing out the advanced and the romantic qualities of the Liszt sonata and doing ths same with the Berg and Janacek works. All three are handled with spirit and passion. The Janacek certainly sounds more Lisztian than in some of the performances I've heard, and the Berg seems so as well (perhaps as much by being in the context of the others as in its treatment by Varjon). In the process of listening to this disk you begin to rethink the lineages of the works though the magnetic pull of Varjon's commanding performance of Liszt's sonata. It is masterful. At the same time his heightening of the passionate late romanticism latent or overtly present in the Berg and Janacek gives you a new way to think about the music. So in that way alone this is an important recording. Commanding Liszt, superlatively empassioned early Berg, and the half-way to modernist Janacek work. There should be no one standard of performance. Varjon's special way with all three works certainly deserves to stand alongside the very best. The recording would have had a slightly different effect if Varjon had ended with a few of the last Liszt piano works, which in other ways point forward. But that is another aspect of the overall trajectory of all three composers. This program not only makes you appreciate, it makes you think. The end was a beginning. The new emerges from the ashes of the old, the old has inherent within it the seeds of the new, the new partakes directly of the old to nourish itself and become the new that is inherent within it. That's something.